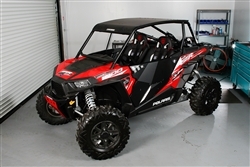 We have just released our much anticipated cage system with no intrusion bar for the Polaris XP 1000! It will complete the ultimate XP1K by adding mean style. This sleek cage is close to 5 inches lower than the stock Polaris cage. Made of 1.75” DOM steel tubing and TIG welded, you will be able to hit the beaten path and turn heads. 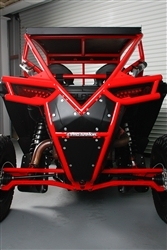 It attaches to the XP1K in the rear of the frame which makes it stronger and prevents from flex and fatigue. It is easy install with no drilling necessary. The cage is available Raw, Semi-Gloss Black Powdercoat, or a Custom Color Powdercoat. We also offer a matching aluminum roof! Call us today at 724-787-4464!